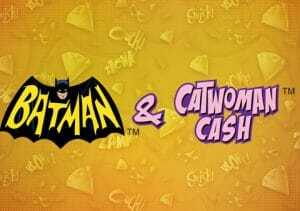 Enjoy some camp, crime solving capers in Batman & Catwoman Cash, a 5 reel, 25 payline slot powered by Playtech. It comes with a bonus feature that awards up to 25 free spins complete with stacked symbols and multipliers that can top 5x. Also on offer are enormous progressive payouts courtesy of the DC Super Heroes Jackpot. Join the Caped Crusader and the Boy Wonder from 25p to £2,500 per spin. Like the fellow Playtech slot that features the Joker, Batman & Catwoman Cash is based on the 1960s TV series which starred Adam West as the Caped Crusader and Burt Ward as trusty sidekick Robin. They’re joined on the reels by Catwoman (Julie Newmar) and an assortment of lower value objects such as Batman’s utility belt, a pair of gold cats, a mask and whip, a speedboat and a helicopter. Batman, Robin and Catwoman can land as stacked symbols. 5 Batmans on a payline will get you 400 coins. More lucrative still is the Batman logo which is the game’s wild. 5 of these will net you a bumper haul of some 2,500 coins. Look out too for the Bonus symbol which is done in the style of the ‘Kapow’, ‘Clank’ and ‘Zamm’ graphics that famously accompanied Batman’s fights in the TV series. When it hits on reels 1 and 3 on the same spin, you’ll land the Cat Burglar Bonus feature. Choose 1 of the Bonus symbols to reveal a cash prize or a +1 which will be added to the multiplier when you eventually trigger the free spins feature. After the multiplier meter is increased, the Bonus symbol transforms into a diamond – when the diamond lands, it will award an instant cash bonus. As the multiplier rises, so do the diamond prizes. Land the Bonus symbol on reels 1, 3 and 5 on the same spin to trigger the Batman vs Catwoman Free Games feature. You’ll then be taken to a new screen and presented with a selection of boxes. Choose 1 of the 4 from Batman to confirm the number of free spins you’ve been awarded (between 7 and 25). Then pick 1 from Catwoman which will reveal which symbol will be stacked during the feature – the free spins play out with the accumulated multiplier from the base game and Cat Burglar Bonus feature (starting at 2x and going up to 5x). The multiplier resets once the free spins are completed. Catwoman then adds extra Bonus symbols to the reels, improving your odds of hitting the Cat Burglar Bonus feature or the Batman vs Catwoman Free Games feature in the 24 base game spins that follow. Your final shot at landing a massive score comes via the DC Super Heroes Jackpot which can hit at random on any spin. Pick from the 20 icons – each 1 will reveal a colour that relates to 1 of 4 progressive jackpots. Keep on picking until you find 2 greens which trigger the Mini, 3 blues which trigger the Minor, 4 yellows which trigger the Major or 5 reds which will land you the big money from the Grand jackpot. As far as variance goes, we’d put Batman & Catwoman Cash on the north side of medium – the best winning opportunities come via the free spins round but you may have to wait a while to trigger it. It can be worth the wait if you combine a high value stacked symbol with the maximum 5x multiplier. Visually, it’s just as camp and ridiculous as the source material including clips from the TV series and a supremely cheesy backing track. Offering a nice mix of quality design and a hard-hitting feature round, Batman & Catwoman Cash packs a more than decent punch. I also recommend you try the Batman & The Joker Jewels video slot which is quite similar and also powered by Playtech.